Hardwood floor sanding restores existing floors after various levels and years of damage. Whether the damage on the is a few minor scratches or an excessive amount of built up stains, we use a three-step sanding process to make your wood floors look brand new! The purpose of sanding your hardwood floors is to remove previous stains and scratches, leaving the floor level so the wood lays smooth and even. 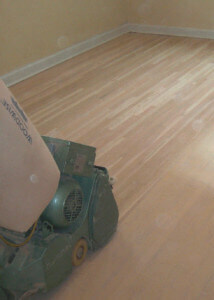 Sanding also brings the grain back to the hardwood floor, pulling through the authentic beauty of the natural wood. 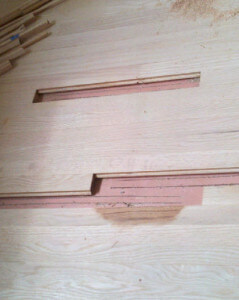 The three-step sanding process varies by the degree of damage of the floor. Floors with more damage require coarser, lower-grit sand paper be used first, followed by two finer passes. Sanding and refinishing hardwood floors typically restores floors to new, but some damage is too great (ex: pet stains) and requires that the damaged area be patched. Most commonly, the Woodchuck Flooring sanding process is done with a 40-80-100 series of passes. In between sanding passes, such things as vacuuming and wood filling are done to the hardwood floor. Paying attention to the smallest of details ensures the highest possible quality. Speaking of details, every corner of each room is sanded and scrapped by hand to avoid any missed spots. Once sanded, hardwood floor refinishing with your choice of colors and finishes is next.